After studying to be a Catholic priest for three years at Ushaw College, Durham, turned to graphic design and graduated from St. Martin’s School of Art in 1985 and the Royal College of Art in 1987. Freelance graphic designer since 1987 undertaking anything from humble print work for small publishers and arts organisations to typographic sequences for TV commercials. Work characterised by careful use of typographic structure, sometimes organic, sometimes highly ‘engineered’, but always deriving from a respect for the material. Since 1995 has been assisted part-time by several ex-students enabling larger commissions to be undertaken, e.g. 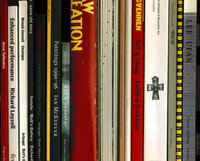 Phaidon’s Art & Ideas series implementation (7 titles designed in the last 2 years). In addition to practice, has been a frequent writer for Eye and other design magazines and contributor at design conferences, and has spoken at colleges throughout England as well as abroad. In September 1991 became a Senior Lecturer (half f/t) in typography at Central Saint Martins College of Art & Design, London. Part of his teaching responsibility is jointly curating the Central Lettering Record with Catherine Dixon.